It's summer and although there's loads of local fresh fruit to enjoy, somehow plenty of popsicles, ice creams and other summer sweets slip in under the radar too. 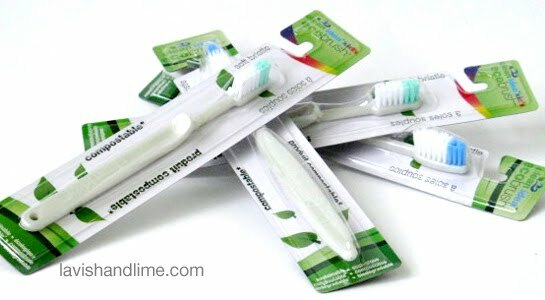 Keep the sugar bugs at bay with our eco-friendly toothbrushes and flossers that literally disappear! When we think dental products, we generally think about all the plastic we end up throwing out after use. Plastic that pretty much stays around forever. Now there's another, more eco-friendly dental option, thanks to our friends at Clean Idea right here in Vancouver. Our Clean Idea biodegradable toothbrush is made from renewable crops like corn, wheat, tapioca and potatoes, instead of petroleum. This eco-friendly toothbrush will become organic soil in 180 days -- so you never have to feel guilty about disposing of your manual plastic toothbrush again! Our biodegradable toothbrush has an angled head to comfortably and easily reach back teeth and only soft bristles are used for effective cleaning that is gentle on your gums. Guaranteed to clean your teeth as effectively as any national brand manual toothbrush - and it will last the same length of time too. 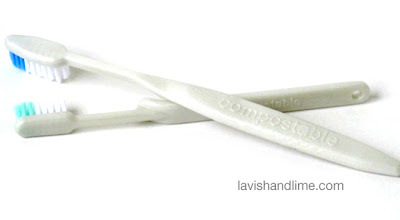 Our biodegradable toothbrush comes in two sizes - adult and children. 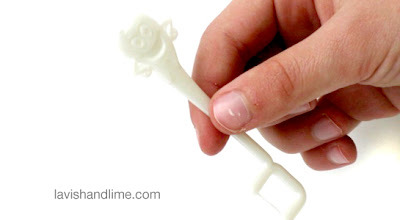 All these same great properties go for our eco-friendly biodegradable flossers too - except the biodegradable kids floss picks also feature a fun tooth-y character molded right into the pick. We have a biodegradable toothbrush pack to give away to one lucky winner. Visit Lavish & Lime and tell us in a comment below which product above all others you wish you could have this summer and a toothbrush pack -- including 1 adult biodegradable toothbrush, 1 child's toothbrush, 1 pack of 30 adult flossers and 1 pack of 30 children's flossers -- could be yours! Please be sure to include your email address so we can contact you if you win. This is our Friday Freebie, and we're happy to take entries through to Wednesday. Deadline for entries is midnight PST Wednesday, July 13th and we'll announce the randomly chosen winner on this blog post and on Facebook Thursday, July 14th - in good time for the launch of our next Friday Freebie. Open to Canadian residents only. Good luck! Well this is an easy decision. I would love the Non-Toxic Push Up Popsicle Molds. I want a water clock! That is so amazing! I'd love a pvc free shower curtain -- boy/girl is great. I would love to have the Envirosax Shopping Bag - boheme 5-pack pouch. You can never have too many reusable bags! I would love ecological sunscreen and a swell bottle (I couldn't decide on one thing). I would love to try Scotch Naturals Nail Polish. It's sandal season and I want pretty toes without the toxins! I'd love the preschool packpack to carry my boy's things around this summer. The non toxic push-up posicle molds would be perfect for my kitchen this summer. I would also love to try the Scotch naturals watercolours nail polish. Sounds like a great alternative to chemical based nail lacquers. I would also like to try the Scotch Naturals Watercolours nail polish. It seems like a great alternative to chemical based nail polishes. I would really like a 650mL glass water bottle in red ~ among other awesome things!! I "love" you on FB!!! I just shared on FB! !